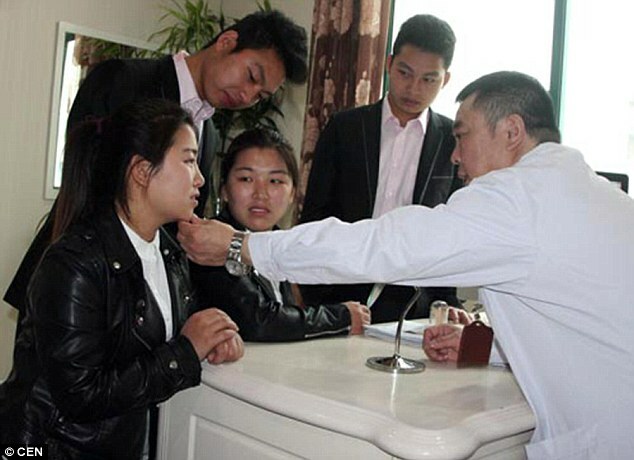 Identical twin sisters who married identical twin brothers are set to go under the knife because they can’t tell who is married to whom, the People’s Daily Online reports. The couples, all from Shanxi province, married in February and had to double check they were marrying the correct sibling during the ceremony. On April 7, doctors in Shanghai accepted a request by the couples to make slight adjustments to their faces so that they could tell each other apart. Strangely even though the sets of twins attended the same high school however they did not officially meet until a year ago. Zhao Xin and Yun Fei (right) were pictured with their younger siblings Zhao Xuan and Yun Yang. The same of everything! They even have similar cars with only one character defining them apart. The pair of twin brothers named Zhao Xin and Zhao Xuan married their fiancées Yun Fei and Yun Yang on February 15 at a joint wedding in Yuncheng, Shanxi Province. Both sets of twins were born in 1994 and come from nearby villages. The sisters were raised in Taihou Village while the brothers grew up in the Zhaojiazhuo Village. The two villages are about six miles from each other. They attended the same high school but didn’t meet until they were introduced via a matchmaker a year ago. They spent a whole afternoon talking to each other. A month later, the father of the brothers returned from running his restaurant business in Beijing and endorsed their engagements. More impressively, after they got married, the two couples even drive almost identical cars. The only difference between the two white Volkswagens is one letter on the car plates. However they’ve had trouble identifying each other. According to one of the brothers, he went out for a walk and found himself holding hands with his brother’s wife by mistake. Friends and family found it difficult to tell them apart and often complained. They are thought to be so alike that it is even impossible to tell them apart by their voices. Finally frustrated with being confused for the other couple, they decided to visit a plastic surgeon during their honeymoon in Shanghai. The doctor said that it would be possible to get their appearances mildly changed. According to Dr Kang,he will make slight alterations to their noses and foreheads. Further details of the surgery are yet to be revealed.